Tag Archive | "witch cupcakes"
Hello everyone! 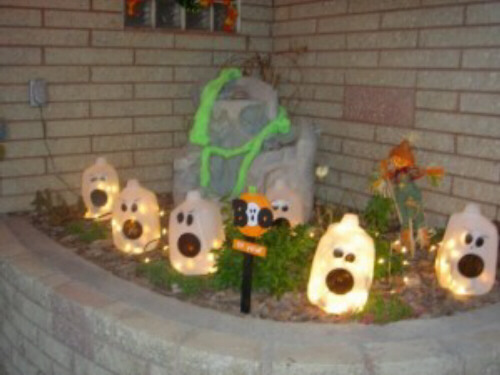 I’m back, and I’m going to tell you about some last minute Halloween decorations and treats. First off, the picture at the top of this article is of a fun decoration you make from a water jug using a black sharpie marker and some lights. I plan to make this fun creation, and I urge you to make one as well. Another fun creation has to deal with food. So moms, get your frying pans and oven mitts out because this is a good one. 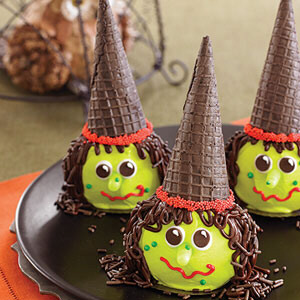 The picture to the left is of these treats called Witch cupcakes. They are basically cupcakes with an ice cream cone on their heads, a gummy for a nose, M&M’s for eyes, and icing for hair and mouth. In case you were wondering, for Halloween I am going to be a ghillie sniper. If you don’t play video games like me, a ghillie sniper is one of those army guys that have those grass suits. They lay in the grass, camouflaged, hidden from all enemies.